Since its foundation, the Irish state has failed to create a strong domestic manufacturing base on which to grow its economy. This has led to the situation where we are heavily reliant on, and at the mercy of foreign investment. It was hoped and expected that the huge amount of investment that occurred in Ireland during the boom years would encourage and facilitate a strong growth in our domestic economy, through the learning of foreign skills and expertise, and the fostering of entrepreneurial opportunities. This has not transpired, and the Irish capitalist class remain notably weak. Currently, the Irish private sector that does exist accounts for only 10 percent of our exports. 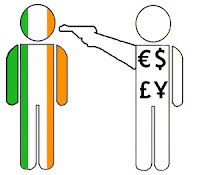 This figure shows the fundamentally weak nature of indigenous Irish capitalism. Between 2000 and 2007, at the height of the Celtic Tiger period, Irish businesses that based themselves in the export sector did not, as one might expect, create any new jobs but in fact shed 11,000 of them. Also during this period, Irish venture capital invested 1.5 billion here, yet invested 60 billion in foreign property deals. If our own private export sector could not create jobs during the boom years, how can we realistically expect them to create jobs now during an economic depression? The idea that Multinational Corporations (MNC's) will provide a route out of this crisis for the 440,000 unemployed is another myth that requires debunking. In Ireland, MNC's account for around 140,000 workers. This is only around 7 to 8 percent of our total workforce. This figure is quite surprising considering the amount of emphasis that the government places on this sector. MNC's also account for 90 percent of Ireland's total exports, with pharmaceutical companies accounting for 60 percent of that figure. Since 2005, exports in pharmaceuticals here grew by 30 percent, yet during that same period there was no corresponding job growth in that sector. Their real effect on the economy is limited at best, with much of their raw materials imported and their profits repatriated. The fact that MNC's account for 90 percent of our exports, yet still only employ 7 to 8 percent of the total workforce is both a damning indictment on indigenous capitalism, and an indicator that a recovery based on FDI will not provide the required jobs to take the hundreds of thousands off the dole queues. So what do all these figures indicate? They indicate that the daily mantras that we hear from the government and the mainstream media that we must keep our corporation tax rate low, that we must become more 'competitive' through lowering wages, that we must satisfy the markets and that if we do all of this, we will see an influx of FDI which will create the jobs needed to get us out of the unemployment crisis, are mantras that are based on flawed analysis of the nature of the Irish economy. The figures also indicate that a different strategy will be required to create the jobs that the thousands that are emigrating and the many thousands more who languish on the dole need. If, as is evident, the Irish and international investors are unable to create these jobs, then the state must step in and provide them. With two simple measures this could be achieved. Firstly, the banks must be nationalised and taken under democratic public ownership so that they are run in the interests of ordinary people in society and not for private profit. This would allow for representatives from all sectors of society to run these banks in the interests of society, in a way that provides cheap credit so that communities, Small and medium sized businesses etc would be able to create the jobs that we need to economy moving again. Secondly, the state must nationalise the major profit making industries in Ireland. The knowledge and skills to run all of these industries are already here, but a system of private profit leaves hundreds of thousands on the dole while billions sit unproductively in bank vaults. These are indeed revolutionary measures, but they are ones that would change the nature of Irish society. They also pose the revolutionary questions, if capitalism can't provide the people of Ireland with a guaranteed job and a decent standard of living, then what kind of system will? I like your writing, but I see a couple of issues regarding your solutions. The first was to nationalize the banks in order to give "cheap dollars" to the masses. Cheap dollars can mean many things in the financial world. All can lead to disaster. 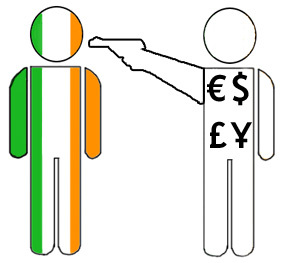 In fact, the "Celtic Tiger" was grown through exotic interest rates, which is, cheap dollars. High interest rates are inversely proportional to the value of a currency. A command-and-control system over the means of production, has been proven, through various economic models, to be unsuccessful. Boom-and-bust periods are a normal business cycle. You will need to provide more detail to your solutions and make them more flexible.